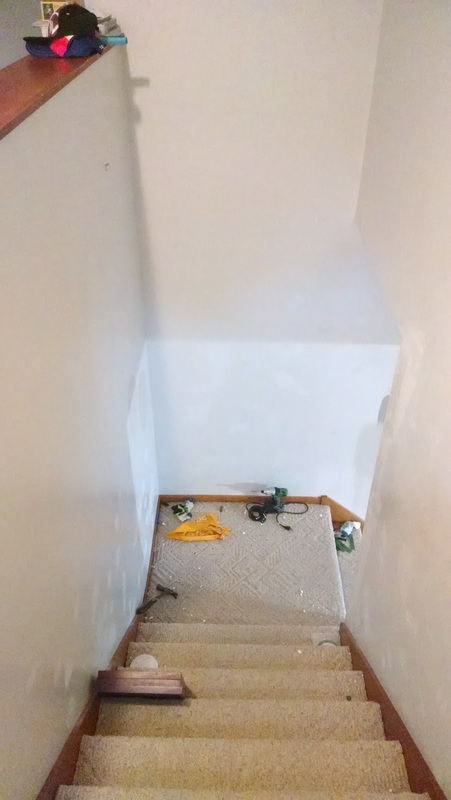 Is there any better way to waste a perfectly precious rainy day than to patch the walls of the stairway and hall that your sweet angel-baby sons use on a daily basis? You guys, there should be special wall substances for parents with boys because I am here to tell you, dry wall does not cut it. Drywall has an amazing capacity for dings and dents, it scrapes and nicks, and then of course there is also the chipped paint. We have lived in this house for approximately 8 1/2 years. In that amount of time my 3 boys (and their cousins and friends and quite possibly there father...) have managed to make approximately 78,005 dents and holes in the drywall of what we will now refer to as the Spackle grave yard. The good news is, there are many dents and holes with a precious memory attached to it. Like the time the boys were practicing there Ninja Warrior wall climbing skills and one of them slipped and left a dent in the wall with their head. Or the fact that a loving grandparent gifted one of the boys with a dart board for their birthday and even though they are plastic tipped darts, and even thought the dart board was placed in front of a mammoth sized bulletin board, there are now no less than 7,293 small holes in the walls around said dart board (there could be a reason we never replaced those darts as they 'mysteriously' disappeared). I am patching holes and dents that have no explanation whatsoever. How, pray tell, do you get a perfectly circular dent in the wall the size of a $0.50 cent piece 2 inches off the floor in a corner? And what exactly is happening in this hall and stairs (besides Ninja Warrior training) that could possibly create all of these holes and dents? Match box car races, sliding down the stairs on a plastic mattress into a pile of pillows, sword fights (sometimes with real swords), running, throwing all manner of objects (let's be honest, there are almost continuous projectiles flying through this hallway), wrestling, and all manner of childhood mayhem. Also, when you are a home schooling family, and you buy your child a mini catapult and a mini ballista because you are learning about medievil times in history, it may just have an adverse effect on the walls of your home. Maybe. Did I tell you there is no drywall mud left on any of the outside corners? We are down to that pretty metal strip on every one. I know, I know, it's just boys being boys, having fun and making memories. They don't mean it. They are not trying to tear the house down around you as you sit on the couch trying to sneak in another cup of chai tea and read that book that's been collecting dust for weeks now. It isn't their fault that their mother is her own special kind of crazy and thought that it was time to repaint the white walls that haven't been painted since before her family moved into this home. Although, can the walls really be considered white anymore? Since the hand rails were torn from the wall because of boys hanging on for dear life as they run around the corner, the walls are actually a streaked and muddy brownish grey, but only from about 3 ft high and down. It's my own special kind of wainscoting. I call it Fingerprints and Boogers. I think instead of repainting we will just cover the walls in corrugated steel. The rustic farmhouse look is 'in' now. We live in the country, near a farm. So it could be a good look for us. Do I hear someone say ship-lap? Or for a cheaper option, we could re-purpose some of that old wood paneling they like to put in trailer houses. That stuff is virtually indestructible. There has to be a creative and durable solution. How many more dents will there be when I get around to changing that bulb? Glory, maybe we will just leave it burnt out and go with 'mood lighting'. We can just wait to repaint when the boys move out.